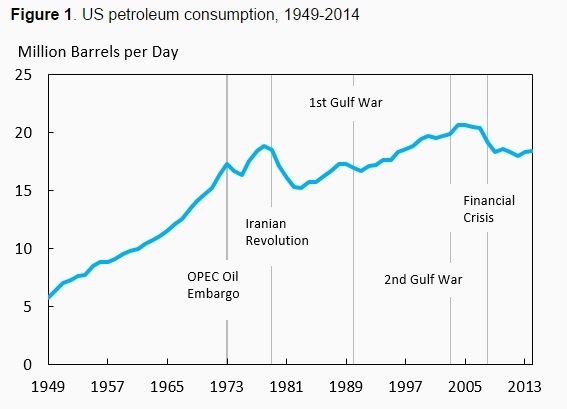 The levelling off of US petroleum consumption was largely unanticipated. In 2003, the US Energy Information Administration, which provides some of the most influential and well-regarded analysis in the field, projected that consumption would steadily grow at an average annual rate of 1.8% over the subsequent two decades. Consumption in 2025 was projected to be 47% higher than its 2003 level. The actual path that consumption has taken, however, diverges dramatically from this projection (Figure 2). Consumption in 2014 was actually slightly below 2003 consumption, and about 25% below the projections for 2014 that were made in 2003. We refer to this as the 2014 consumption surprise. Moreover, the difference between the actual and projected consumption in 2014 – 6.4 million barrels per day – is almost double the unexpected production increase over the same period (3.4 million barrels per day). The surprise consumption reduction frees up roughly $150 billion (2014 dollars) for spending on non-petroleum goods and services. There is even greater divergence in longer-term projections – the most recent projection for 2025 is 34% lower than the projection made in 2003. This 2025 consumption surprise frees up roughly $250 billion for spending on other things. Source: Energy Information Administration’s Annual Energy Outlook. The surprising decline in consumption is an almost uniquely American story. In percentage and absolute terms, the 2014 and 2025 surprises in the US are much larger than those observed in many other countries and regions of the world. For example, the consumption surprise for European OECD countries is about half that of the US, amounting to about 13% of petroleum consumption in 2015 and declining slightly to a projected 12% in 2025. For other OECD countries the surprises are even smaller, at 7% and 11% in 2015 and 2025. The consumption surprises for Japan lie just below those of the US. The objective of our recent report (CEA 2015a) is to identify the mechanisms behind the large decrease in US petroleum consumption relative to past projections. Quantifying the underlying causes of the remarkable consumption decline improves understanding of why the consumption path has changed, how it might evolve in the future, and the role that public policy might play in further change. Petroleum consumption accounts for about 40% of US energy-related carbon dioxide emissions, and projections of long-run greenhouse gas emissions from petroleum consumption are highly dependent on the drivers of the consumption decline. If the Great Recession were the primary driver, for instance, we would expect petroleum consumption to return to past trajectories as the economy recovers, causing consumption-related emissions to rebound. On the other hand, if fuel economy standards were the primary driver, consumption and associated greenhouse gas emissions might continue to decline. As illustrated in Figure 3, the transportation sector accounts for 80-90% of the 2014 and 2025 petroleum consumption surprises. The industrial sector accounts for most of the remainder, at around 20% in 2014 and 7% in 2025, while the residential and commercial sectors account for a combined 4% of the surprise in both years. While other sectors experienced similar percentage surprises as the transportation sector, because they consume considerably less petroleum, they do not contribute nearly as much to the overall story. Our main analysis includes renewables such as ethanol in total petroleum products consumption, but the surprise reduction in the consumption of oil derived from fossil fuels is even larger than the surprise reduction in petroleum consumption because of the increasingly large share of petroleum derived from renewables like ethanol. Excluding ethanol, the size of the overall petroleum consumption surprises would be roughly 0.6 million barrels per day larger in both 2014 and 2025, and equal to 7 and 11 million barrels per day. Source: Energy Information Administration; CEA calculations. Within the transportation sector, declining vehicle miles travelled has had a greater effect on consumption than rising fuel economy to date, but the role of fuel economy grows through 2025 (in Figure 4 the fuel consumption rate, as measured in gallons per mile, is the reciprocal of fuel economy). In 2014, rising fuel economy explains roughly 25% of the consumption surprise, and vehicle miles travelled explain the remaining three quarters. In the 2025 projections, however, the factors are more comparable, with fuel economy accounting for 45% of the surprise and vehicle miles travelled accounting for 55%, demonstrating the growing rule of public policies like fuel economy standards in shaping fuel use. Figure 5 illustrates the contributions of each sector to the overall petroleum consumption surprises. In the figure, the transportation sector petroleum consumption surprise is decomposed further into the vehicle fuel consumption rate, vehicle miles travelled, and other factors such as aircraft consumption. In 2014, vehicle miles travelled is the single most important factor, accounting for just under half of the total petroleum consumption surprise. The importance of the fuel consumption rate doubles (in percentage terms) between 2014 and 2025. Because the transportation sector accounts for 80-90% of the two consumption surprises, and vehicle fuel consumption dominates consumption of other fuels in the transportation sector, we next discuss the factors that explain vehicle fuel consumption rates and miles travelled. Fuel economy standards explain up to 43% of the increase in fuel economy between 2003 and 2014, and will explain an even larger portion going forward as tighter standards set in. High gasoline prices —relative to 2003 projections — explain at least 17% of the fuel economy increase to date. According to new analysis from the Council of Economic Advisors (an agency within the Executive Office of the President of the United States) much of the change in the trajectory of vehicle miles travelled can be explained by changes in demographics, such as the ageing of the population and the retirement of the baby boomers, and by changes in economic variables like income, employment status, and gasoline prices (CEA 2015a). The Council of Economic Advisors used panel data on the driving behaviour of households from 1990 through 2009. The analysis projects the path of vehicle miles travelled since 1990, given only information on demography and economic factors like income and gasoline prices. Absent such information, a linear trend would have simply predicted a continued increase in vehicle miles travelled from 1990 forward, as illustrated by the green line in Figure 6. Because of the ageing of the population and other demographic factors, the model predicts that vehicle miles travelled levels out in the late 1990s and starts to fall after 2001. However, changing demographics and economic factors are not the entire story. In fact, the red and blue lines in the figure show that actual vehicle miles travelled was slightly higher than the model’s prediction, suggesting that, if anything, the factors that are omitted from this model have led to more driving and not less. There is also evidence that the effects of demographics on vehicle miles travelled have changed as well. For example, individuals younger than 40 drove 5% less in 2009 than individuals who were younger than 40 did in 1990. Because demographics and economic factors themselves are easier to project than the changes in their impacts, the importance of these changes presents a challenge to projecting future petroleum consumption. Source: National Household Travel Survey; CEA calculations. Documenting the surprising decline in US petroleum consumption, both in absolute terms and relative to past projections, we find that the transportation sector explains most of the surprise between previous projections of petroleum consumption and actual data, as well as the surprise between previous and the most recent projections. Miles travelled by passenger vehicles plays an important role in the transportation sector, but rising fuel economy (implying declining fuel consumption rates) has a large influence that is growing over time. Importantly, there has also been a large unexpected increase in ethanol consumption relative to 2003 projections. Given the large and growing importance of fuel economy standards and ethanol, this analysis suggests that federal government policy has, and will continue to have, a substantial effect on US petroleum consumption and on overall carbon emissions reductions by the transportation sector. President Obama’s clean energy strategy has made concrete strides to reduce petroleum consumption and shift the US economy to a low carbon future through policies like fuel economy standards and tax credits for renewable energy (CEA 2015b). The president remains deeply committed to providing a clean and secure energy future for our children and will continue to act to reduce carbon emissions through policies like the Clean Power Plan and engagement with international allies. CEA (2015a), Explaining the U.S. Petroleum Consumption Surprise, Washington, DC: Council of Economic Advisors. CEA (2015b), Economic Report of the President, Washington, DC: Council of Economic Advisors. Energy Information Administration (various years), Annual Energy Outlook, Washington, DC. Author: Lydia Cox is a Research Economist at the Council of Economic Advisers. Jason Furman is the Chairman of the Council of Economic Advisers. Joshua Linn is currently serving as a Senior Economist at the Council of Economic Advisers. Maurice Obstfeld is the Class of 1958 Professor of Economics at the University of California, Berkeley.